Perhaps no spot in Nebraska is so surrounded by historical and geographical landmarks as this one. Numerous landmarks of the period of the Indian Wars are visible from here. The site of a legendary battle between the Sioux and Crow Indians, Crow Butte, lies directly to the south. It was also a pioneer landmark for Indians, soldiers, and cattlemen. To the west are the Red Cloud Buttes. From these well known buttes, one may see the town of Crawford to the east, Fort Robinson to the south, and the site of the Red Cloud Agency to the southeast. The escarpment stretching north from the buttes was also a prominent early landmark. Approximately half a mile northwest of this point is the site of the Treaty Tree. There in September, 1875, while thousands of members of the Sioux Indian Nation looked on, the Allison Commission made an unsuccessful attempt to buy the Black Hills area from the Indians. It was not until after the bloody campaigns of 1876 that the Sioux Commission, headed by George Manypenny, succeeded in purchasing the area. 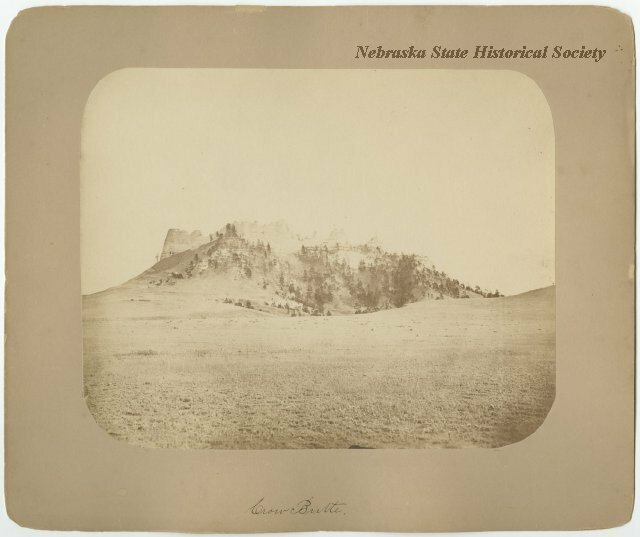 “Butte Country,” Explore Nebraska History, accessed April 18, 2019, https://mynehistory.com/items/show/120.